With the growing amount of data captured via the proliferation of channels and customer touch points, today’s companies struggle to gain and maintain all the elements that comprise their customer’s identity. This inefficiency creates gaps within the identity data making it hard to scale marketing, provide personalize customer experience and measure marketing investments. Identity Management Platforms provide a framework that links customer Identifiers (Name, Address, Phone, Mobile, Email, Cookies, Device IDs and IP Address) while simultaneously appending a unique persistent ID that can be used across channels. 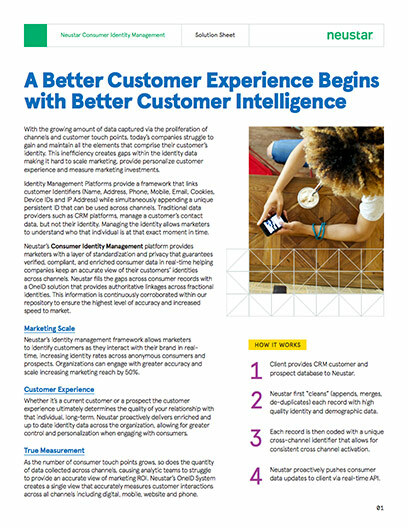 Traditional data providers such as CRM platforms, manage a customer’s contact data, but not their identity. Managing the identity allows marketers to understand who that individual is at that exact moment in time. Neustar’s Consumer Identity Management platform provides marketers with a layer of standardization and privacy that guarantees verified, compliant, and enriched consumer data in real-time helping companies keep an accurate view of their customers’ identities across channels. Neustar fills the gaps across consumer records with a OneID solution that provides authoritative linkages across fractional identities. This information is continuously corroborated within our repository to ensure the highest level of accuracy and increased speed to market. Neustar’s identity management framework allows marketers to identify customers as they interact with their brand in realtime, increasing identity rates across anonymous consumers and prospects. Organizations can engage with greater accuracy and scale increasing marketing reach by 50%. Whether it’s a current customer or a prospect the customer experience ultimately determines the quality of your relationship with that individual, long-term. Neustar proactively delivers enriched and up to date identity data across the organization, allowing for greater control and personalization when engaging with consumers. As the number of consumer touch points grows, so does the quantity of data collected across channels, causing analytic teams to struggle to provide an accurate view of marketing ROI. Neustar’s OneID System creates a single view that accurately measures customer interactions across all channels including digital, mobile, website and phone. As the number of data sources used to feed organizations customer intelligence increases, gaps between the data become more frequent. The inability to link those data sources across systems create a fragmented view of your customer or prospect resulting in a poor experience. By continuously corroborating, verifying, and appending missing information across customer records, Neustar is able to link those partial identifiers to produce a 360-degree view of your customer. Neustar’s OneID system creates a persistent cross channel identifier to unify, personalize, and activate engagement at the enterprise level. Linking consumer records across touch points while enriching consumer identity with demographic, behavioral, psychographic & geolocation data provides marketers with a single lens of the consumer across screens. The ability to identify a quality lead or an existing customer in real-time is crucial across the marketing supply chain. Imagine your call center is able to identify a prospect the second the call is received, reducing call times and improving customer service. Or your digital team being able to accurately identify an existing loyalist even if that customer hasn’t authenticated.